M4A is proud to make this resource available for download on our website. M4A provides a 2 hour CEU training program which is available at no cost. Upon completion of the training, local law enforcement and first responders will be officially designated as a “dementia friendly department”. M4A will provide certificates, posters, and stickers to promote this official designation across local communities. Contact Robyn James at rjames@m4a.org to schedule a group training event or to get more information on our Dementia Friendly initiative. A short video portraying a good dementia-friendly response by law enforcement. 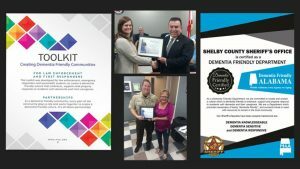 Shelby County Sheriff’s office receives the first dementia-friendly designation in Alabama. 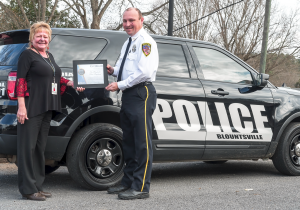 BLOUNTSVILLE POLICE DEPARTMENT TRAINING AND OFFICIAL DESIGNATION.